With Readly you can read Classic Pop Presents Kate Bush and thousands of other magazines on your tablet and smartphone. Get access to all with just one subscription. New releases and back issues – all included. In this special edition we celebrate 40 years of Kate Bush, who’s unique brand of songwriting and performing has bewitched the globe since her debut single, ‘Wuthering Heights’ made UK No. 1 in 1978. Inside, we explore Bush’s career, from her wide-eyed beginnings touted as a child genius, through to the critical and commercial success of her incredible canon of work, and on to 2014’s triumphant return to the stage for her 22-night residency at London’s Hammersmith Apollo. 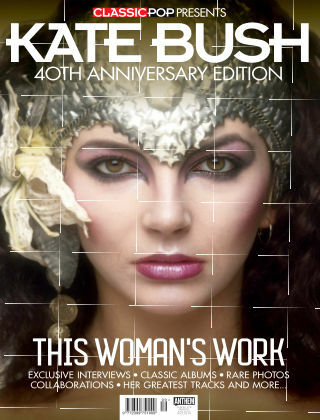 We get the inside track via interviews with KT Bush Band member Brian Bath and session musician David Paton, official photographer Guido Harari, KateBushnews.com founder Sean Twomey, plus there’s a 1979 archive interview with Kate herself. Elsewhere, we take a detailed look at Bush’s musical collaborations, we pass judgement on the finest of her output in our Top 40, and we offer in-depth classic album profiles from across her career including ‘The Kick Inside’, ‘Never For Ever’, ‘Hounds Of Love’, ‘The Red Shoes’ and ‘Aerial’. Lastly, Sean Twomey offers up a fascinating look at the storytelling within Kate’s songs, there’s features on ‘The Tour Of Life’ and the ‘Before the Dawn’ shows, and we handpick our selection of vinyl treasures to be found within Kate’s stunning catalogue.